Only indoor hot spring swimming pool in the Hagerman, ID area! Great place to spend the day with your family and friends. Lifeguards on duty Features: 2' kiddy pool, tube slide, 2 diving boards (high/low) floating log and basketball hoop. Large outside tanning deck. Large party room available. Bring your own snacks/food or purchase from our snack bar. Private hot baths available. (18) RV sites $35 per night- includes water, sewer and electric (40) tent sites $25 per night - fire pits, some with boat docks 2 cabins Located on the Snake River. Great view of 1000 Springs State Park. Boating, fishing and playground. Discount swimming admission for all-day passes. Our River Room has a breathtaking view of 1000 springs and the Snake River. Great for weddings, receptions, corporate events, parties and reunions. Tables and chairs are available. Please call for more information. You're welcome to come and tour our facility. Catering services are also available. Our facility in Hagerman, ID, offers an RV park and camping accommodations, as well as a private Jacuzzi and geothermal-warmed mineral water. From boat docks to the River Room and everything in-between, our hot springs resort provides something for every member of the family and is the only indoor-swimming facility in the area. We’re just five miles south of Hagerman, Idaho, on U.S. Highway 30. 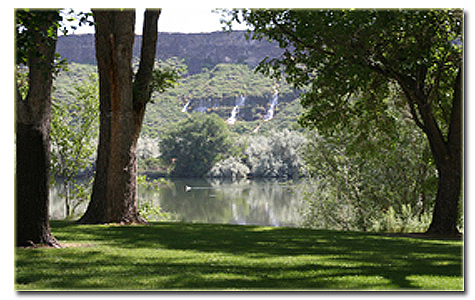 Our hot springs resort sits on the Snake River. Come and enjoy a relaxing vacation in our RV park or campground.